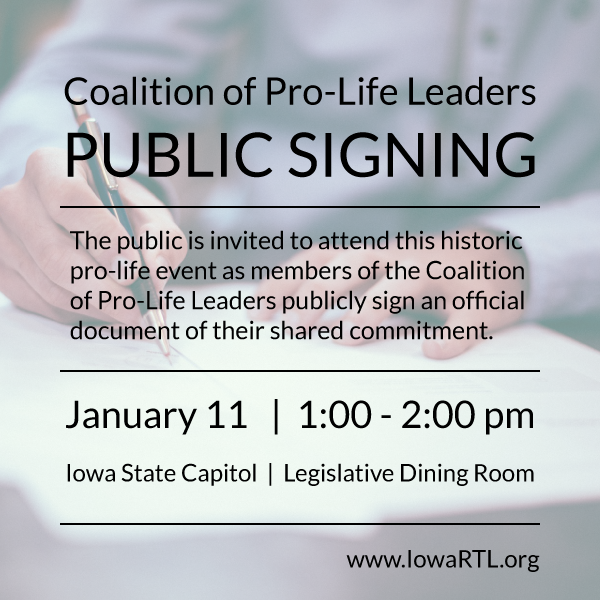 January 9, 2017 – DES MOINES, Iowa – In an unprecedented move, leaders from nearly a dozen pro-life organizations in Iowa are publicly coming together in unified and unwavering support for the passage of pro-life legislation. “Truly the potential is limitless in our efforts to save unborn lives and protect women when we commit to working together,” said Jenifer Bowen of Iowa Right to Life. The creation of this Coalition represents an effort to provide both a more effective and unified message of abortion facts to the public and to debunk the misconceptions disseminated by pro-abortion organizations.